You can walk the length of the main street in this little coastal town in a few minutes. The stiff breeze didn't stop us from enjoying a hearty lunch at Duarte's Tavern. And of course we stopped in at the little boutiques, visited the goat farm and watched tiny crabs in the tide pools at the beach. Later we feasted on Arcangeli Grocery artichoke bread and fresh Harley Farms goat cheese and tomato sauce. 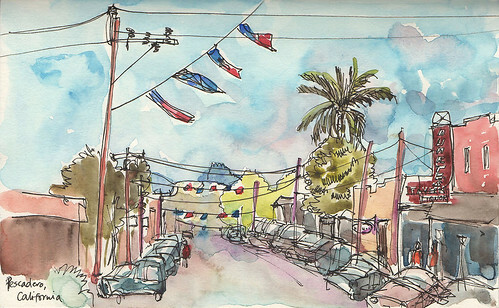 Love seeing your sketch of Pescadero. Small towns are always so fun!